Since its introduction in mid-October, the Selly Express has become a valued resource for UoB students by helping them feel safe at night in Selly Oak. Tensions surrounding the area were a particularly prominent factor in the warm welcome for the service by the student body when it was introduced (ahead of schedule) after a stabbing took place on Heeley Road on October 7th. However, the future existence of the Selly Express has been thrown into doubt over the last two weeks, as the Guild President Reece Patrick Roberts has demonstrated through a series of social media posts regarding funding for the service. A more thorough description of where the funding for the Selly Express has been coming from can be found in the News section, but in essence the funding dispute between the Guild and the University has emerged because the money for the service was provided through a Residents’ Association Scheme (RA) underspend spanning several years. The RA get their money through tuition fees paid to the University, but Roberts told Redbrick that the RA is managed by the Guild, meaning that the money legally belongs to them. Ironically, Roberts’ Facebook post outlining this came in the same week that the Green Heart was officially opened to the public (Friday 18th). In September, Redbrick reported that the overall cost for the a series of on campus projects including the Green Heart would be between £160-£180 million, with the Green Heart itself estimated to have cost £11.5 million on the website of contractor Willmot Dixon. Many students are rightly arguing that the Green Heart is more of a vanity project for UoB than something that serves a tangible purpose for them, such as the Selly Express. That’s not forgetting some of the University’s other more expensive displays of showboating over the last few years; In March 2017, it transpired that a banner hanging over the old library (which measured 69.3 by 13.7 metres) to advertise the Green Heart project cost £27,000. Where that banner is now is anybody’s guess, but the money used for that could cover the Selly Express’s running costs for several months. The highly controversial Dubai Campus, which opened in September, is just another expensive (and ethically questionable) demonstration of the University’s inability to represent the wishes of its students. The wariness coming from the University - led by Sir David Eastwood, a man with, according to the Times, an annual salary of £439,000 - regarding the funding of the Selly Express beyond this year is not only laughable in light of some the University’s more extravagant expenses, but potentially dangerous. The service is dual-purpose in this way: Students who use it are not only protecting themselves at night from the risk of muggings, assault or worse, but also from the feeling of being mentally drained that can come with feeling unsafe. A 2012 study from Arizona State University revealed that feeling unsafe in your own neighbourhood is directly linked to poor mental health. With the University’s mental health policy also coming under fire (the Guild’s Welfare and Community Officer Izzy Bygrave started a petition on Monday 14th to ‘lobby the Uni to write a mental health strategy’ for the next three years), it seems irresponsible for a University official to seemingly write off something that can benefit students’ mental health. In terms of the disagreement between the Guild and the University about where the funding for the Selly Express is coming from, it is as if there has been a major breakdown in communication between the two, which is causing students to feel confused and uncertain about the future of the Selly Express. It also casts questions over some of the other schemes proposed by the two bodies to help keep students safe. 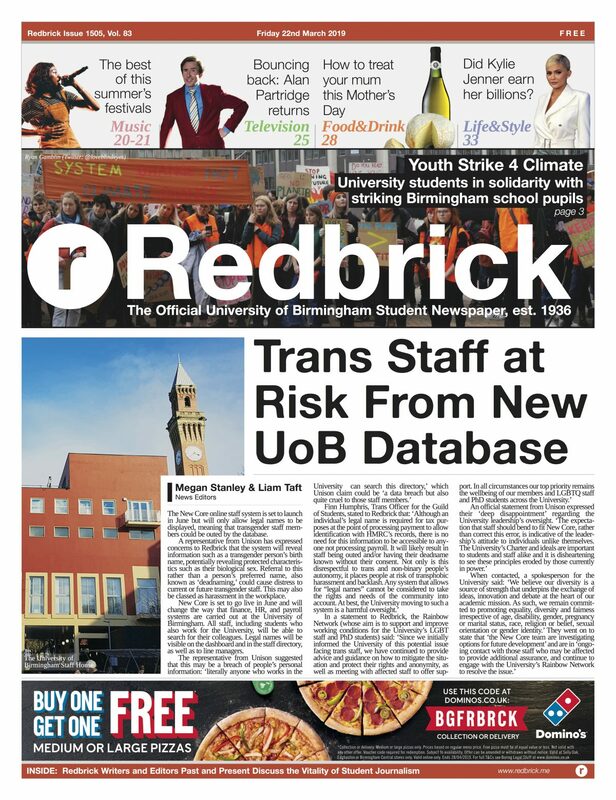 This includes the University’s promise to upgrade ‘all of the CCTV across campus’ (as the Director of Student Affairs told Redbrick News in an interview in October). Fundamentally, it’s vital that students are made aware of what the situation is surrounding the policies implemented to help them feel safe when they are studying at the University of Birmingham, and the clarity and availability of the information published to the student body surrounding issues such as the Selly Express must be improved. As a sign that the University listens to and appreciates the concerns raised by the student body, the Selly Express should remain a part of the University beyond this year, assuming it is used enough by students. The full statements from the University's spokesperson can be seen here.